Retinopathy associated with Bright's dis­ease was known long before Von Graefe and Schweigger (1860) described the retinal features in hypertension. Keith, Wagner and Barker (1939) were able to associate different grades of hypertensive retinopathy with dif­ferences in prognosis and this is considered a landmark in the scientific clinical study of hypertensive retinopathy. Macroangiopathy in hypertension affects vessels in retina, kidney and brain, probably .to a similar extent (Hickam et al. 1953Picker­ing, 1969) and these changes are the collateral effects of general arterial condition. The present study of hypertensive vascular disease includes correlation of retinal vas­cular changes with other systemic com­plications, besides study of various epidemio­logical factors. This study was carried out in 200 patients of hypertensive retinopathy attending Medical Ophthalmology Clinic of Dr. Rajendra Prasad Centre for Ophthalmic Sciences, All­India Institute of medical Sciences New Delhi. The parameters recorded were detailed. history, systemic examination, ocular examination including fundus evaluation by direct ophthalmoscope under mydriasis. Keith, Wagner and Barker's (1939) classifica­tion was used for grading the severity of retinal changes. Various investigations including ECG, Renal function tests viz, blood urea, serum creatinine, IVP, Renal angiogram etc. were performed and patients were graded according to WHO's classifica­tion of hypertensive disease. 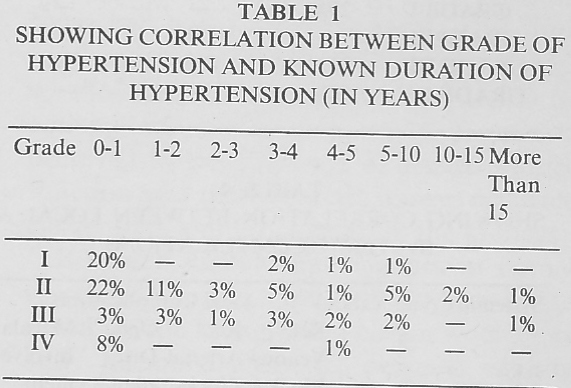 Correlation between grades of hyper­tension and known duration of hypertension in years is shown in [Table - 1]. [Table - 2] shows the relation of local com­plications of hypertensive retinopathy with age and simultaneous presence of arterios­clerotic changes in retinal vessels. Retinal vessels are routinely inspected because of their unique accesibility during the course of physical examination and from their condition, inferences are often made as to the condition of vessels of similar size in other body regions. Hypertensive retinopathy is a relatively common condition in ophthalmic practice as ophthalmoscopy of a hypertensive patient forms an indispensable aid in its assessment, and prognostication but even with frequent detection of hypertensive retinopathy, its value vis a vis general systemic complications is seldom brought out. 59% cases were referred from Cardiac Clinic, 32% from Obstetrics Department from the All-India Institute of Medical Sciences and 9% cases from Eye O.P.D. The patients who came to the ophthalmologist in the first instance had complaints in the form of either headaches, dimunition of vision or floators. Essential hypertersion was found in 62%, secondary hypertension in 29% and PET in 9% of cases. Inspite of the diverse referrals, the age distribution analysis revealed a Gaussian Curve pattern (Maximum incidence was bet­ween 41-50 years of age with decline in extremes of age); the same as seen in essential hypertension. However, in cases referred from Obstetrics Department (preeclamptic toxemia or toxemias of pregnancy) the max­imum incidence was in the age group of 25­35 years. Males (67%) were preponderant inspite of biased referrals and this may be due to greater capability of females to withstand hypertension. The comparatively lower incidence (25% in 41-50 years age group in contrast to 1% in 71­90 years age group) and severity of retino­pathy in patients of essential hypertension in elderly age group may be due to setting in of arteriosclerotic changes which have a protec­tive influence against raised intravascular pressure (Leishman, 1957). Lowered inci­dence in the elderly age group may also be due to lesser life expectancy of patients with grade III or grade IV hypertensive retinopathy, which of course is less in this age group. Grade II retinopathy was present in max­imum number of cases (50%) followed by Grade 1(24%) Grade III (15%) and Grade IV (11%). Grade I and Grade II retinopathy were mostly observed in patients having hyperten­sion for less than 1 year. There was no direct correlation between the duration or severity of hypertension and changes in retinal arterioles [Table - 1]. Thus, arteriolar changes may not be specific for assessment of hyper­tension as these are also seen in older nor­motensive subjects (Wise et al, 1971). A.V. crossings changes (arteriosclerotic) have been seen in 43% of normotensive men aged 55-60 years (Van Buchem et al, 1971) which emphasises the fact that resilience of blood vessels play a definitive role in the evolution of hypertensive retinopathy in elderly age group. Grade III retinopathy was seen in cases with varying duration of hypertension. Exudative pattern was more commonly seen with higher grades of hypertension. Grade IV retinopathy, however, was observed in cases with about a year's duration of hypertension which might mean that it develops in accelerated hypertension rather than in cases with long duration. Another reason might be very low life expectancy of these patients. 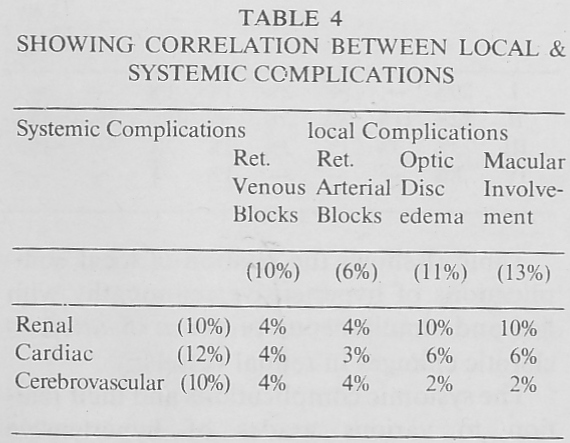 Complications seen were, macular involve­ment (13%), optic disc involvement (11%), central retinal vein block (6%), branch vein bleck (4%), and central retinal artery occhr­sion (3%) [Table - 2]. Macular involvement.rol optic disc oedema were, observed in cases with accelerated hypertension and Grade IV retinopathy. All vascular occlusions Were seen in cases above 40 years of age and associated with arteriosclerotic changes emphasizing its role. 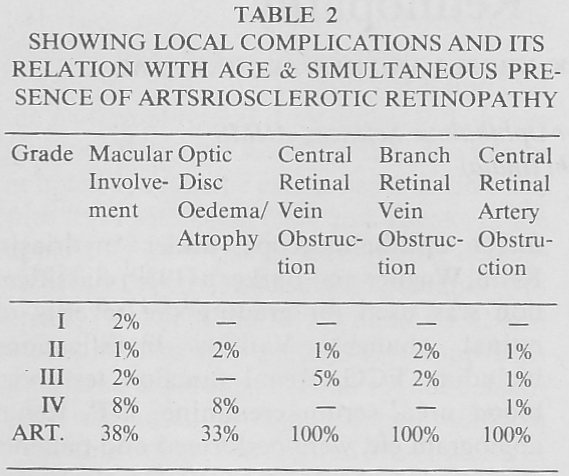 Ellis et al (1964) have reperted similar finding of hypertensive retinopathy with arterios­clerosis. Renal involvement was detected in 10%, cardiac complication in 12% and cerebrovas­cular episodes in 10% of these cases [Table - 3]. 60% of patients having renal complications had grade IV retinopathy while 20% of them had grade III retinopathy. This find­ing is consistent with that of Sicker et al (1955) who found that impairment of retinal arterial activity in the course of hypertension occurred in the presence of altered kidney function and these retinal changes occurred earlier than similar changes in the kidneys. It is well known that changes in retinal vessels go hand in hand with changes in the vessels in the kidneys and cotton wool spots and haemorrhages, if present, signify arteriolar necrosis in the kidneys. As no gross retinal oedema was detected in young hyper­tensives with renal failure and uremia (10%) it is presumed that retinal manifestations may not be helpful in distinguishing between primary and renal hypertension. 80% of the patients having cerebrovascular and cardiac complications had grade III retinopathy. This is in agreement with the findings by Hickam et al (1953) who also found positive correla­tion between retinal and'cerebral vasular res­ponse in degenerative vascular discases like hypertension and arteriosclerosis. It was observed that on correlation of retinal changes and the grades of hyperten­sion (WHO) similar pattern emerged. 32% of patients with grade II hypertensive retino­pathy had grade II hypertension out off a total of 50% and majority of patients having grade III retinopathy (14% out of 15%) had some organ hypertrophy or damage [Table - 5]. 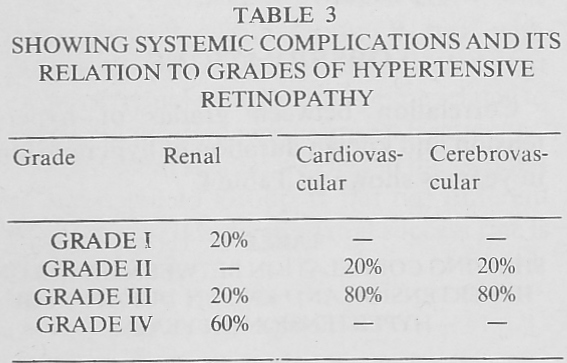 Similarly, almost all patients having grade IV hypertensive retinopathy had evidence of organ hypertrophy or damage. This substan­tiates the earlier observation of the generalised nature of arterial disease in hypertension and the importance of retinal changes as a parameter of the ravages caused by this disease. 200 patients of hypertensive retinopathy were studied. Various epidemiological factors and the correlation with systemic com­plications of hypertension were analysed. It was seen that age distribution pattern was similar in essential hypertension and hyper­tensive retinopathy. Females were found to withstand hypertension better than males. Arterosclerois emerged as an important fac­torin causation of local complications of hypertenssiveretinopathy. Systemic com­plications were almost always associated with severe changes in retinal vessels. 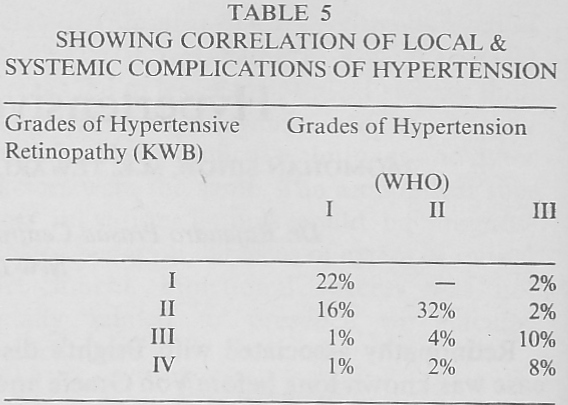 There was a close correlation between local, ocular and systemic complications of hypertension. Ellis, CJ. ; Hamer, D.B. ; Hunt R.W. ; Lever, R.S. ; Lever, A.F. ; Peart, W.S. ; Walker, S.M. (1964) Br. Med. J. 2, 1093. Hickam, J.B.; Schieve; J.F. ; Wilson W.P. (1953) Circula­tion, 7:84. Keith, N.M.; Wagener, H.P. ; Barker, N.W. (1939) Am. J. Med. Sci. 197:332. Leishman, R. (1957) Br. J. Ophthalmol. 41:641. Pickering G.W. (1969) Trans. Ophth. Soc. U.K. Vol. LXXXIX, 83. Sicker HO; Hickam J.B. (1953) Circulation 7, 79. Sommers, S.C.; Relman, A.S.; Smithwick, R.H. (1958) Amer. J. Path. 34, 685. Von Graefe and Schweigger (1860) quoted by System of Ophthalmology Vol. X p. 321, Ed. Stewart Duke Elder (1967). Van Buchem, F.S.P. ; Van der Heuvel Aghina J.W.M. ; Van der Heuvel J.S.A. (1964) Acta Med. Scand. 176, 539. Wise, G.N. ; Colin, T.D. ; Henkind, P. (1971) The retinal circulation, Harper and Row Publishers N.Y. Evansten, San Francisco, London.